The best whole life insurance policy is going to be the one that does the job you need it to do. 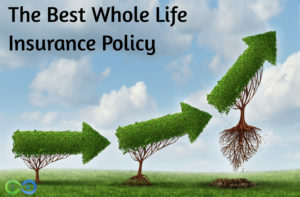 There are two ways to approach whole life insurance policy design. The most obvious is to solve for the death benefit. If your human life value is $1,000,000, then you require a million dollar policy. The other way to design your policy is to focus on cash value growth. The following article highlighting the best whole life insurance contains two parts. You can also jump to our short video on the best whole life insurance. There really is no “best” life insurance policy because what is best for you may not be the right fit for someone else. It is only by discovering what your unique goals and objectives are can we rightly determine what the best life insurance policy will be for you. Let’s explore the two different ways you can design your whole life insurance policy: Cash Value vs Death Benefit. The best whole life insurance policy focused on cash value accumulation and growth will have some or all of the following characteristics. When your focus is cash value accumulation, you want to locate the best dividend paying whole life insurance companies that have consistently paid out dividends. Life insurance dividends have many uses, such as cashing out the dividend, using it to pay premiums or purchasing paid up additions. Through the use of paid-up additions, you can add both cash value and death benefit to the policy. This helps grow the policy exponentially over time and it a necessary ingredient for crafting the best whole life insurance policy focused on cash value accumulation. Now, it needs to be mentioned that not all whole life policies pay a dividend payment. Only participating life insurance policies offer a dividend payment. If you want dividend payments you need to make sure you choose participating whole life insurance. The flexible paid up additions rider is a nice perk if you are not able to be fully funded in a given year but has the flexibility to “catch up” in other years. Sometimes your financial situation is great and have you extra income coming in. During these times you can add additional cash into your policy, which helps the cash value and death benefit grow. In times when money is scarce or finances are tight, you can hold off on putting more money into your policy via paid-up additions. The flexible paid-up additions rider is a great option for anyone who does not have a steady income. Having a solid term rider available is important to get the policy right below the MEC limits without having the death benefit all in higher priced permanent insurance coverage. The term rider can be deigned so that it falls off the policy once the death benefit grows to a certain point. It may also be convertible term life insurance that allows you to convert all or a portion to permanent whole life insurance coverage if you should choose to elect the conversion option. Typically, your whole life insurance policy will be designed so that you pay premium payments until age 100. Whole life to age 100 will have a lower cost than limited pay whole life insurance, such as 10 pay or pay to age 65. Having the option to pay into your policy for life or allowing the policy to pay for itself after you have made premium payments over time is a great option to include in your policy design. This way you get to choose if you want to continue to add funds to your policy over your lifetime or stop making payments after the initial limited pay timeframe. Internal costs and fees vary among the different whole life insurance companies. This is important for your agent to know because you do not want to have your company’s policy costs eating up your cash value growth. For example, one top whole life insurance company has a great dividend history and a rock-solid name, but it does not always illustrate well for high cash value growth due to the contract cost. Early fees and costs can severely hamper the early growth of your policy versus a company that does not charge as high of initial fees and costs. Over the long term this may not be as much of a factor if the company has higher profits and pays out a superior dividend, but it is worth considering at the outset. Most important, work with an expert that understands how to maximize the contract for the best interest of the client and is not focused on commissions. When the whole life insurance policy is designed for cash value growth, the commission is much lower, often 50% or more lower, then when the policy is focused on death benefit protection. Further, it helps to choose an expert in policy design that can choose from many different mutual insurance companies. Mutual insurers have shown that they are financial secure places to store your money versus stock companies that focus on maximizing shareholder profits. The best whole life insurance policy focused on death benefit protection will have some or all of the following characteristics. As much as choosing a highly rated insurance company is important for policies focused on cash value growth, it is even more imperative when you are getting the life insurance primarily for the death benefit protection. Dividends still matter when you are designing a policy for death benefit coverage. Even a policy focused on the death benefit needs to be with a company that has a strong history of dividend payments so that the death benefit can grow over time. That way, your death benefit grows with you as you age. Since you do not need all the bells and whistles associated with a properly designed cash value whole life insurance policy, you want to focus on companies that have low fees and costs so that your policy can operate as efficiently as possible. To keep your whole life insurance rates down, having a term rider attached to your policy is a great way to begin your policy with a high death benefit for a lower cost. Term Riders are available to blend coverage and to reduce your cost. Chronic Illness and Terminal Illness riders are used to maximize the leverage the death benefit of the policy. You can access a portion of your death benefit if you are diagnosed with a qualifying chronic or terminal illness. This feature is typically included in the policy no matter if designed for death benefit protection or cash value growth. However, additional living benefits may also be desired. For example, long-term care riders are a good option for someone who desires death benefit protection but with the added layer of protection in case they need long-term care one day. And with the growing costs of long-term care, the long-term care rider is a great feature to add. If you are not concerned with cash value you can use the dividend option to reduce premium down the road if needed. A whole life policy designed for the death benefit insurance coverage can utilize the dividend payment to even pay premiums once the policy has grown large enough to be self sustaining. Stretching out your life insurance coverage for as long as possible will give you a high death benefit at the lowest premium payment. You should utilize whole life pay to 100 to keep your premium payment lower. AUL is a top mutual insurance company (A+ rating with A.M. Best). We like that the company offers non-direct recognition for policy loans. Additionally, its paid up additions rider option for the company’s whole life policy offers great flexibility. American United Life also offers what is called a declining paid up additions load. This just means that folks can slowly decrease the amount of paid up additions being paid. AUL also offers a unique whole life insurance rider. Its Indexed Dividend Crediting Option (IDO) Rider allows policyholders to participate in market moves earning up to double their dividend, without sacrificing whole life guarantees. Foresters Financial offers one of the only participating no medical exam whole life insurance policies, such as the company’s 20 pay or whole life to age 100 product options. If you are interested in getting a great whole life policy but don’t want the hassle or a life insurance blood test, Foresters should definitely be considered. For more on this member of our list, please stop by our Foresters Financial review. Guardian is a top rated insurance company (A.M. Best rating of A++ superior). It practices direct recognition, but it is committed to the concept of treating whole life insurance as an asset. It is worth pointing out that Guardian also has excellent customer service ratings. In addition, Guardian’s whole life policy gets extra marks for flexibility due to the variety of options for premium payment models. For more on Guardian, please check out our Guardian Life review. Lafayette Life is a solid choice for whole life insurance. It ranks as one of the best whole life insurance companies due to its non-direct recognition status, sound business rating (A+ Best, AA second highest rating out of 22 by S&P) and excellent track record. For more on this company, please stop by our Lafayette Life review. MassMutual and the best whole life insurance are synonymous. Needless to say, we think very highly of this carrier. MassMutual is one of the premier whole life insurance companies and offers excellent cash value accumulation and wealth building policies. Mass Mutual is a mutual company that has consistently offered a sizeable dividend, often top in the industry. Additionally, MassMutual’s paid up additions mixed with its 10 pay whole life is tremendously effective at maximizing cash value growth. MassMutual has an A.M. Best rating of A++ Superior, and a AA+ rating from S&P. For more on this member of our best whole life insurance companies list, check out our MassMutual review. Mutual Trust Life Insurance provides maximum cash value accumulation. The Maximum Accumulation Dividend® option works in tandem with the Flex Pay Paid-Up Additions Rider or Annual Premium Paid-Up Additional Insurance Rider, providing maximum cash value accumulation on a continual basis, while avoiding a modified endowment contract. We at I&E believe this is a great whole life insurance company. However, if we had one negative to speak of it would be the lower ratings it has received in contrast to its peers. MTL has a Comdex ranking of 78, which reflects a lower overall financial rating vs the competition. For more on this member of our list, please visit our Mutual Trust Life Insurance review. New York Life is the largest mutual company in the United States AND one of the largest life insurers in the world. For 2019, New York Life currently ranks as the second highest rated life insurance company behind Northwestern Mutual with an A++ rating from A.M. Best. For more on New York Life, please check out our review of New York Life review. Ohio National is a solid mutual company (A+ rating from A.M. Best) that has consistently gained high recognition as a strong contender for offering policies that focus on cash value accumulation and growth. If you are interested in the best whole life insurance policy, Ohio National must be considered. For more on this carrier, please visit our Ohio National review. PennMutual is another excellent mutual company (A+ by A.M. Best) and a current favorite here at I&E. They are a direct recognition company, and yet their track record of policy performance for cash value accumulation and growth is exceptional. Penn Mutual provides great flexibility in paid up additions payment options. For more on Penn Mutual and why it makes our top 10 best whole life insurance companies list, please check out Penn Mutual review. Security Mutual Life is a non-direct recognition company. SML has an A- rating from A.M. Best, which is the 4th highest rating of 15 offered by Best Company. Although not as high a rating as its peers, it is a great option for cash value whole life insurance. Among the many riders offered are a Chronic Illness Benefit, Enhanced Paid-Up Additions rider, and a 5-year Own Occupation Disability Waiver of Premium rider. For more on this top whole life insurance company, please see our Security Mutual Life review. The top rated whole life insurance company in the United States did not make our list. That is primarily because we cannot offer the company because of the company’s requirement that only captive agents can offer the company’s products. As a result, the company has a cult like following among its adherents. Therefore, to avoid any Northwestern Mutual agents from showing up here and demanding an explanation on why the company did not make our list, we offer this brief explanation in advance.